SAINT AUGUSTINE – Wednesday, Oct. 17 Flagler College will open its doors to the public for a unique look inside the world of academia. At 5 p.m. in the Lewis Auditorium, faculty from different disciplines will present various research projects centered on the theme of the college’s 50th anniversary in a special edition of a faculty program called “Scholarship 20/20.” This event is free. Since 2016, “Scholarship 20/20” is a faculty-led program of research sharing for the campus community that occurs once per semester. In honor of the college’s 50th, faculty saw this year’s program as an opportunity to share their work beyond the campus. Dr. Ed McGinley, an assistant professor in the department of natural sciences has been involved in the program since its inception and was quick to suggest to the college’s 50th planning committee that the program be included as a special event. McGinley organized the first program in 2016 after attending a local edition of a Pecha Kucha. From there he saw how the idea of sharing your work could be applied on campus. “This special edition of ‘Scholarship 20/20’ will infuse the idea of change into these presentations: how has the college, the community, and the environment changed over time,” said McGinley. This event is the third in a string of others scheduled to celebrate with the community the college’s 50th anniversary. Other events include an upcoming campus-wide Open House on Saturday, Nov. 3, a special fall theatre arts musical production of “All Shook Up” from Nov. 7 – 10 starring Broadway actor Justin Matthew Sargent, and a book reading by author Harvey E. Oyer III on Dec. 1. 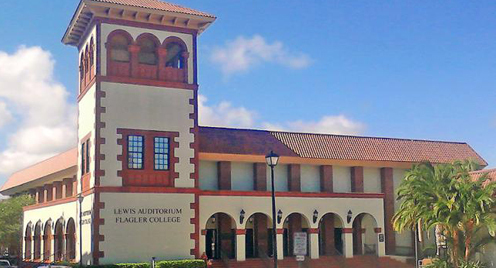 For more information about the free, public events taking place in celebration of the college’s 50th anniversary, please visit www.flagler.edu/flagler50.